Primary Natural Resources uranium, coal, iron ore, tin. A LANDLOCKED republic in West Africa, Niger is bordered by ALGERIA to the northwest, MALI and BURKINA FASO to the west, BENIN to the southwest, NIGERIA to the south, CHAD to the east, and LIBYA to the northeast. Its capital, Niamey, is the largest city; other urban centers are Agadez, Maradi, Tahoua, and Zinder. Niger’s climate and terrain rank among the hottest and driest in the world, since four-fifths of the country consists of desert; the remainder is dry savannah. Less than 4 percent of the land is arable. Only one major river, the Niger, runs through the southwest. Niger’s population is largely rural and engaged in pastoralism or subsistence agriculture. The majority of the population lives in the south. The Hausa, Niger’s largest ethnic group, are 56 percent of the population, followed by the Djerma (Zarma) at 22 percent, and the Beri Beri (Kanouri) at 4.3 percent. In the northern deserts live the Fula/Fulani, who make up 8.5 percent of the country’s population, followed by the Tuareg at 8 percent, with 1.2 percent represented by Arabs, Toubou, and Gourmantche. Niger is ranked amongst the poorest countries in the world, and is heavily dependent upon foreign aid for basic needs. The country’s economy has taken a recent downturn because of the decreasing demand for uranium, which was Niger’s largest export. Neolithic remains have been found in Niger, and the Aïr Massif was explored by the Romans in the first century C.E. Major trans-Saharan trading states were established from the 11th to the 16th century by the Tuareg (Agadez), the Kanuri (Bilma in eastern Niger), and the Hausa (Zinder.) Much of Niger fell under the control of the Songhai Empire throughout the 15th and 16th centuries; eastern and southern Niger were annexed by Bornu after the fall of the Songhai Empire, and the Djerma settled in southwest Niger in the 17th century. The Fulani gained control of southern Niger in the early 19th century during the jihad of Usman dan Fodio. The French made Niger a colonial holding in 1885 then established military posts in south Niger, but because of Tuareg resistance, Agadez along with much of the north did not fall under French control until 1904. 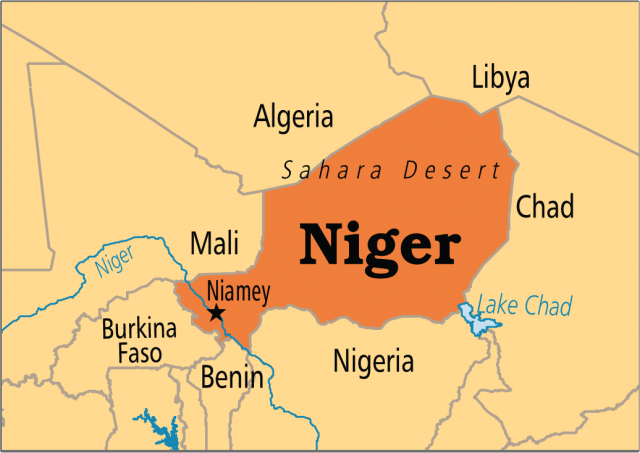 Niger stayed a colony until the late 1950s, gaining full independence in 1960. Since independence, Niger has undergone a series of crises. The 1960s saw relative stability despite rebel insurgencies. Niger’s economy then plummeted during the Sahelian drought of 1968–75, which destroyed much of Niger’s livestock and agricultural resources and prompted a military coup. During the 1980s, the uranium boom boosted Niger’s economy but led to huge disparities in wealth that caused civil unrest. The 1990s saw armed conflict with the Tuareg in the north, several changes to the government, and the assassination of military dictator Ibrahim Baré Mainassara in 1999. France suspended aid to Niger following the assassination, which prompted Niger to hold free elections and create a civil government.